Michael Low first heard about biochar in 2007 from a story in the magazine, Acres USA. The article sparked his interest and he began researching the use and production of biochar to see how he could utilize it on his farm, Green Fire Farm, in rural Vermont (United States) to improve the soil’s health. 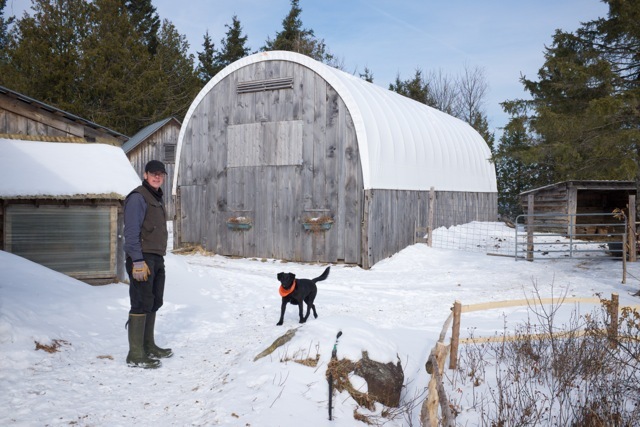 When Low and his wife, Hart Brent, started working the land at Green Fire Farm in 2002, they encountered roadblocks to establishing a viable commercial farming enterprise—mainly due to soil health. They found the soil fertility severely depleted after more than a dozen families struggled to farm the hilly land over the course of 200 years. They also struggled with how to ethically and intelligently export any large quantity of farm products, without further compromising the already weak living systems. To overcome these difficulties, they started using restorative farming practices—adding more to the system than they removed—to build a deep reserve for challenging natural events and the inevitable extremes inherent in farming. This reserve is essentially an investment in the land, and biochar is a major key to this investment. In addition to using the biochar on the farm, Low and Brent now sell their product under the name “Dynamic Biochar Preps” at the Montpelier Farmers Market and online through their website, as well as on Amazon.com. 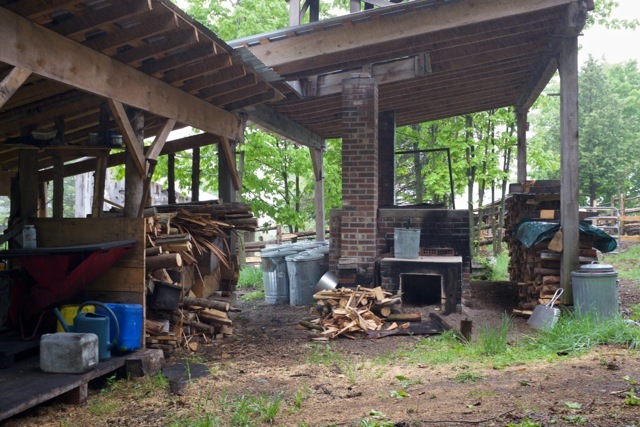 In 2009, after deciding to proceed with biochar on the farm, Low procured plans from Chris Adam to build an Adam retort. The Adam retort was initially designed as a low cost retort for developing countries as it is scaled to animal and human power—which turned out to be the perfect biochar making solution for Low and Brent. 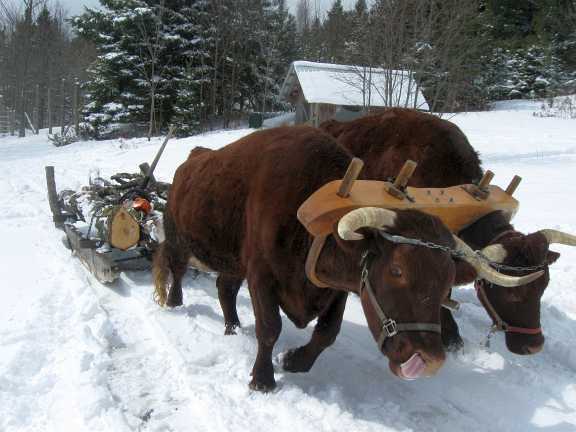 Instead of using tractors for power, they have a pair of Devon oxen, Will and Abe, who pull wood from the land as the biochar feedstock. To ensure the most sustainable operation, Green Fire Farm utilizes “worst first” logging of their land by harvesting the biomass that is not well suited for other purposes. 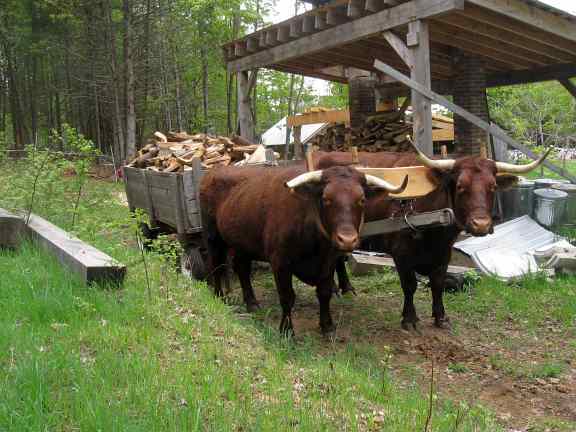 Once Will and Abe bring the wood to the kiln area, it is chopped to a smaller size. The kiln uses about one cord of wood per load. The day prior to firing, the feedstock is stacked neatly inside the kiln for premium gas flow during pyrolysis. The kiln firing is an all-day process, starting about 7:00 in the morning. Over the next 4 – 5 hours, the kiln heats up with the feeding of the firebox. Once most of the moisture in the wood is cooked off and the volatile gases are released, it is ready to switch to the gasification mode. This mode lasts about five hours and then the kiln is shut down and cools overnight. The biochar in the kiln is unloaded into metal cans the morning after the original firing. Low and Brent use a simple chipper-shredder to grind the biochar into the perfect consistency for use in soils. Prior to grinding, the material is wetted and inoculated with a blend of microbes and mycchoryzae and once ground, it is ready for farming and gardening applications. 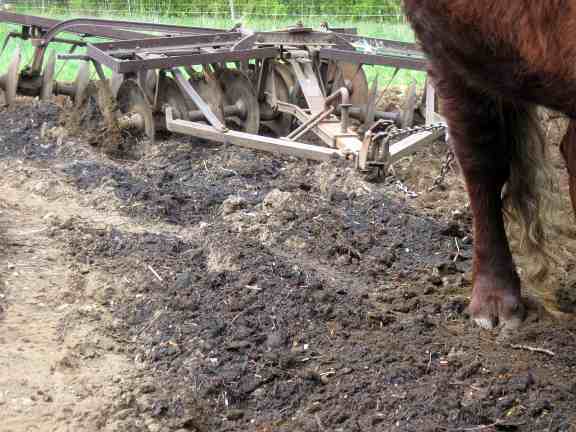 After being inoculated and mixed with compost, the biochar is added to fields through discing, or spread with a manure spreader and allowed to sink in. Low and Brent have seen great improvements in field crops with the addition of the inoculated biochar. Since starting to adapt carbon farming practices such as mob grazing and biochar they have seen the actual carrying capacity (number of animals they can support on their farm) rise 450%. In the gardens, they have experienced better drought resistance and higher volume yields. Green Fire Farm also uses biochar throughout the winter. They practice a bedding pack system with their chickens and dairy goats—adding fresh hay and straw bedding daily. Into this pack system they periodically add a layer of biochar which is further ‘charged’ up with beneficial nutrients from the animal manure and urine. They have found that the biochar also reduces the smells of ammonia from the animal urine. The draft animal stalls in the main barn are cleaned daily and with each wheelbarrow load of manure that goes out to the compost pile, they add 1 – 2 gallons of biochar. Like the pack system utilized for the chickens and goats, mixing the biochar with the compost ‘charges’ up the biochar with nutrients and also stabilizes the compost giving it a much longer shelf life once it is put in the gardens or spread in the hay fields. Says Low: “The ‘green fire’ in our farm name refers to the life force within the soil that with care will reflect in vibrant health for plants, animals, and us. We cultivate this fire with restorative farming practices that we hope will inspire others to also feed the Earth’s green fire.” Low and Brent are planning a modular teaching program on the farm to raise awareness and knowledge of restorative farming, permaculture, biochar, and carbon farming via one and two day courses. These small-scale farm courses are aimed primarily at college-age students to provide hands on learning opportunities on a working farm. 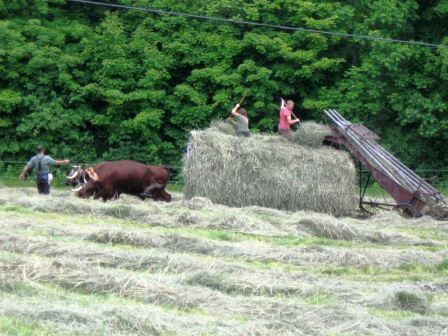 For more information on Green Fire Farm, please see: http://vermontbiochar.com/biochar.